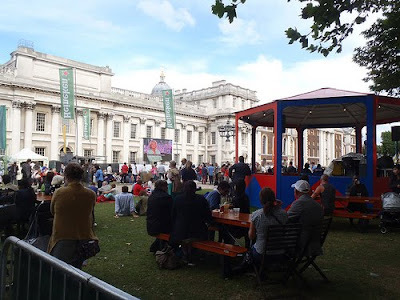 Your author still isn't quite sure about the branded pens which have sprung up around town for enforced enjoyment of The Event, but one pleasant oasis with sport screens is the Greenwich Summer Festival, within the grounds of the Old Royal Naval College. The inevitable big screen is not fenced in behind huge crowd fences, and serves up film screenings when the sport is over, in a venue that also offers music, cabaret & theatre and real ale. It's a bit like the amazing offerings that usually happen in London when The Event is not on, and perhaps that's why it is so appealing.